When it comes to spectacular cascades, it's tough to top Upper Whitewater Falls in the Nantahala National Forest in western North Carolina, near the South Carolina state line. 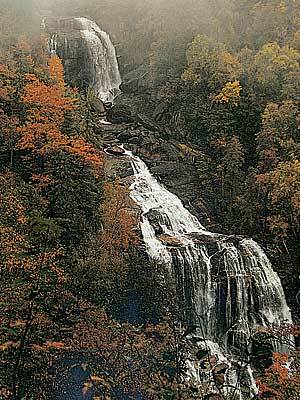 At 411 feet high, it's the highest waterfall east of the Rocky Mountains. A paved walkway from a parking lot leads to a great view from an upper overlook. A lower overlook is accessible via 154 wooden stairs. The waterfall is along State Highway 281, about 25 miles southwest of Brevard, which is where U.S. Highways 64 and 276 meet, some 30 miles southwest of Asheville. From Highway 64, turn south on Highway 281 and follow the signs; the waterfall is about an 8-mile drive from the turnoff. A $2 parking fee applies. For details, call the Highlands Ranger District office at 1-828-526-3765.